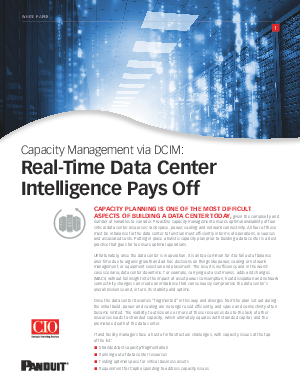 CAPACITY PLANNING IS ONE OF THE MOST DIFFICULT ASPECTS OF BUILDING A DATA CENTER TODAY, given the complexity and number of variables to consider. Proactive capacity management ensures optimal availability of four critical data center resources: rack space, power, cooling and network connectivity. All four of these must be in balance for the data center to function most efficiently in terms of operations, resources and associated costs. Putting in place a holistic capacity plan prior to building a data center is a best practice that goes far to ensure optimal operations. Unfortunately, once the data center is in operation, it is all too common for it to fall out of balance over time due to organic growth and ad hoc decisions on things like power, cooling or network management, or equipment selection and placement. The result is inefficiency and in the worstcase scenario, data center downtime. For example, carrying out asset moves, adds and changes (MACs) without full insight into the impact of asset power consumption, heat dissipation and network connectivity changes can create an imbalance that can seriously compromise the data center’s overall resilience and, in turn, its stability and uptime.